All aluminum and stainless steel, preferred by colonizing Purple Martins! Give purple martins in your area an ideal colony with the Coates WatersEdge Purple Martin Suites Eight Room Suite! Coates constructed this house with martins' utmost comfort in mind. To keep birds cool, the aluminum house has ventilation slots next to the entrances and holes at the sides of the roof for air circulation. Aluminum also deters parasites much better than wood homes and is more durable in general. The included guard rails, when attached to the porches, prevent baby birds from falling out of the nest. Each two-room suite has a crescent shaped entrance hole and a separate internal entrance to the elevated back nesting room, providing maximum protection from predators. Both rooms of each suite measure 6"L x 6"W x 6"H, giving martins their ideal nesting space. An extra perch sits atop the reflective roof, letting birds congregate and scout for insects. Hinged doors allow you to monitor the suites' activities and easily clean out any old nests. Attach the included martin decals next to each SREH to attract enough martins to populate your colony. Use the included Coates Universal Mounting Plate to attach this home to a pole with a 1.25" - 1.375" outer diameter or an inner diameter of 1.625". Mount the Coates WatersEdge Purple Martin Suites Eight Room Suite high on a post in your yard to enjoy the returning musical tenants. Made in the USA. Have this Purple Martin House shipped to you fully assembled! The Coates Purple Martin House Kit comes with easy to follow instructions; however, we would be happy to ship your Martin House fully assembled, if you wish. Simply select the "Assembled" option when you checkout your order. Note: This item ships dimensionaly oversized when assembled. Additional shipping charges may apply depending on destination zone. Have us ship you a fully assembled Coates multi-unit aluminum Purple Martin House, or install one on your premises today and enjoy the peace and serenity that this marvelous bird offers. Eliminate insects without pesticides. Some studies show that a Purple Martin eats up to 2,000 pesky insects a day. Your Coates Purple Martin House will be a symbol of your dedication to support the environment as well as a centerpiece for your landscape. 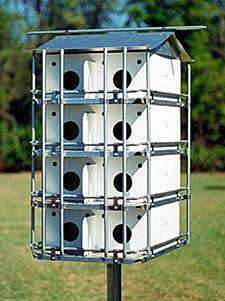 Did you know... Aluminum houses seem to be best suited for the Purple Martin. They are lightweight; do not harbor parasites, easy to clean, and cooler, if properly ventilated. The purple martin is America's most desirable backyard bird. Homeowners enjoy purple martins for their beauty of flight, social behavior, pleasant chirp, and insect eating ability. Purple martins are totally dependent on humans for housing and are very friendly to humans. Coates Predator Guard Kit for 8 room House. These owl guards are a very effective way to protect martins from unwanted predators. The guard rods attach easily and pop off from their clamps to allow landlords access for monitoring. The predator guard kit may be installed to prevent predation by flying predators such as owls and hawks. This kit includes 8 aluminum guard rails that are vertically positioned, guarding the entrance holes of each compartment. 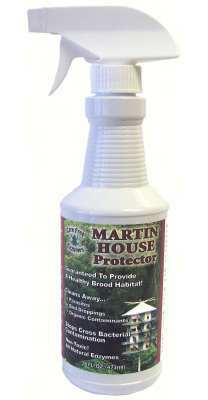 Purple Martin House Cleaner/Protector - A special formulated cleaner/protecttor for your aluminum houses. Provides a healthy brood habitat. Cleans away parasites, bird droppings and organic contaminants. Stops cross bacterial contamination. Non-toxic, all natural enzymes. When applied as directed, the product will remain effective for several months. A fine mist should be applied prior to closing in the winter and opening in the spring. No rinsing is required. Product will not evaporate, when it becomes damp the product will become active again. 1 Pint (16 oz. Spray Bottle) should last for several seasons.